The Hearst Building, located at the corner of Third and Market Streets in San Francisco, is part of the colorful California history that stretches back to the gold rush days. It witnessed developments by its ownership that changed the way newspapers were read and politicians of the day were viewed. Today it is a landmark building that has retained its unique and beautiful architectural features designed by famous architects of their time, but with modernized operating systems. 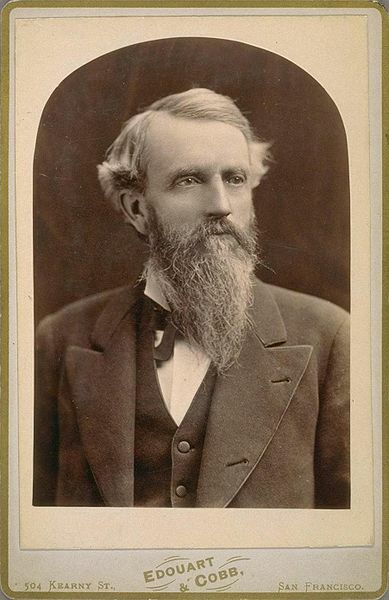 George Hearst, William Randolph Hearst’s father, made his fortune in mining. George had been a successful prospector, using his skills to identify favorable geologic quartz formations and investing in mines during the California and Nevada mining booms of the 1850s. In 1859, Hearst purchased a one-sixth interest in the Ophir silver mine, which later became known as the Comstock Lode. He made successful investments in several other mines including the Anaconda copper mine in Montana and the Homestake gold mine in South Dakota in 1877. In 1880, George Hearst acquired a small newspaper called the San Francisco Examiner. In 1887, William Randolph Hearst left Harvard and persuaded his father to let him run the then financially unsuccessful San Francisco Examiner. At that time, the paper was operating in a small building located on Sacramento Street between Montgomery and Leidesdorf Streets. William Randolph Hearst acquired the lot on which the Hearst Building now resides in May of 1890. 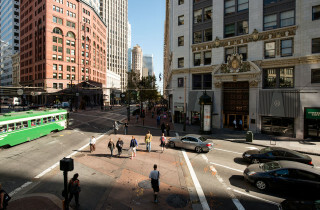 Mr. Hearst was crossing Van Ness Avenue on the north side of Market Street and had observed that the corner of Third and Market had a prominent visibility. 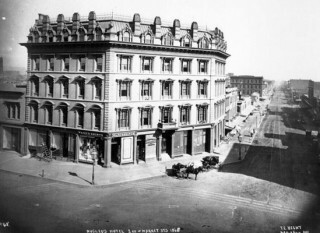 At the time, the 5-story Nucleus Hotel was on the lot. Purportedly, this hotel was the largest brick structure on Market Street at the time. The Nucleus Hotel, which by then was 25 years old and had become dated, was torn down and the 7-story Hearst Building constructed in 1898. The new Hearst building was designed by the New York based architect A. C. Schweinfurth in a Mission Revival style. From this location, Hearst printed the San Francisco Examiner newspaper into the 1960s. That building was destroyed by the earthquake and subsequent fire of 1906 and the decision was made to rebuild. Phoebe Apperson Hearst commissioned the New York architectural firm of Kirby, Petit & Green to design the new structure. The initial thought was to construct a grand 26 story building topped with a 1-story copper lantern balcony on a roof of copper tiles covered in gold flecke. Inside the lantern would be a chiming clock. 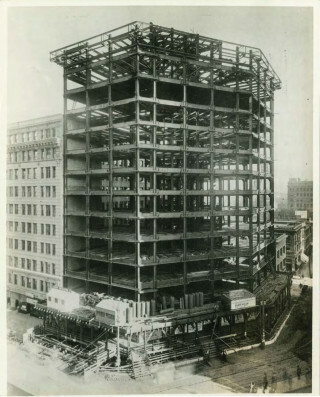 The City decided to implement a coordinated height plan along the Market Street corridor in the aftermath of the near total destruction of the buildings and ruled that the Hearst Building could be no taller than 12 stories above the ground floor. Plans were completed in November of 1909 and construction progressed into 1911. Meanwhile, Hearst’s Examiner newspaper was being printed in a temporary home. The new Hearst building was in a Spanish Revival style construction, with Tennessee Pink marble on the lower floors and a terra cotta façade reaching to the roof parapet. The elevators were among the fastest in San Francisco. On September 11, 1911 the San Francisco Examiner moved into its newly completed home… the 13 story Hearst Building you see today at the corner of Third & Market Streets. 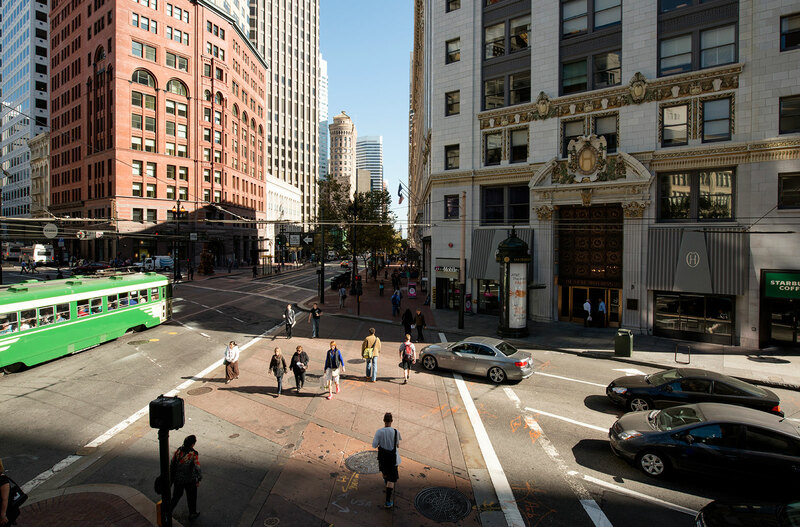 This intersection was to become the heart of San Francisco and became known as “newspaper angle” because of the odd shaped corner configuration and because buildings on the opposite corners of the intersection housed the Call and the Chronicle newspapers. In 1938, famed architect Julia Morgan was retained by Hearst to complete a remodel of the Hearst Building’s exterior entry way, the lobby on the ground floor and the parapet roof structure. Her work included the installation of a field of 20 cast bronze medallions containing fanciful animals above the front door, the addition of patriotic red white & blue lighting around the medallions, a crest above the front entry, an elaborate and beautiful lobby interior and updated elevator interiors. Her work remains unchanged today and is visible to the passerby. In 1965, the San Francisco Examiner relocated to 5th and Mission Streets in a joint operating agreement with the San Francisco Chronicle, also at that location. Art Gensler Architects was hired to update the Hearst Building’s office layout and electrical systems. This was Mr. Gensler’s first major commission. After completing his work, the building was leased to commercial offices. Today, the Hearst Building remains a landmark building of historical significance, reflecting the elegance of a time gone by but containing modern office systems and companies. It is home to a diversified roster of businesses. The Hearst Corporation continues to operate its Western Real Estate operations out of this location.